This next installment from UK ‘Memphis Recording Service’ is released 12th November. This Audio Visual CD release is remastered in high quality sound by Real Bouwman and is by far the best versions ever released. This production is in full cooperation with special thanks to Alfred Wertheimer for rare and some newly discovered photographs for the accompaniment. • CD contains 39 newly restored and remastered classic recordings including: Blue Suede Shoes, Hound Dog, My Baby Left Me, Session recordings, Interview, Previously Unreleased Material and 3 Bonus tracks. The DVD-A version is remastered in high quality 24 bit 96 kHz sound. Experience these recordings in high quality sound for the first time ever. All tracks are accompanied by rare photographs. 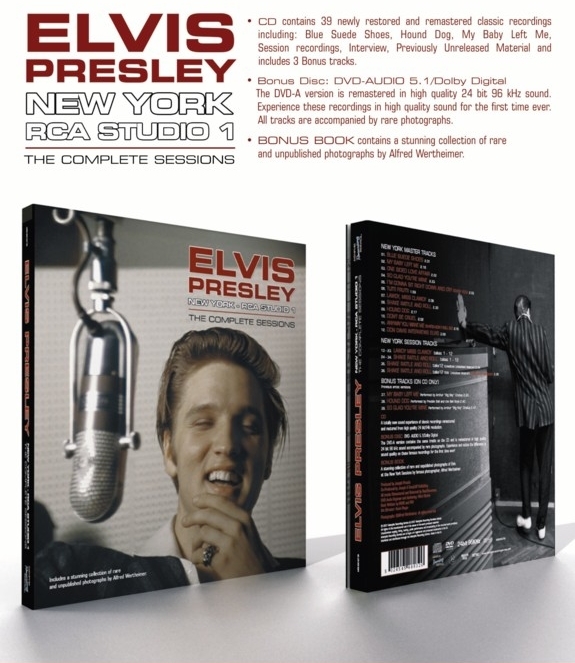 • Bonus Book contains full written notes on the all the NY sessions and is accompanied by many photographs including a stunning collection of rare and unpublished shots by Alfred Wertheimer.